The Taliban insurgency announced Wednesday it has cleared Afghanistan’s northern Jowzjan province of Islamic State, claiming residual IS fighters have fled and surrendered to government forces in the area. Provincial authorities in Jowzjan, which borders neighboring Turkmenistan, have also confirmed about 150 IS fighters, including foreigners, surrendered to the security forces Wednesday in the face of the Taliban onslaught in the Darzab district. Provincial police officer for security Abdul Hafez Khashi told VOA regional IS commander Habibur Rehman was among the militants who arrived at the district police headquarters in the morning and turned themselves in. A Taliban spokesman, Zabihullah Mujahid, while giving details of its counter-IS operation in Darzab, said the Taliban went into action three weeks ago and overran the last IS stronghold early Wednesday. Mujahid said the Taliban offensive killed nearly 100 fighters of Islamic State’s Afghan franchise, known as ISK-P, and captured around 130 others. He said 17 Taliban fighters were also killed in the fighting while another 13 were wounded. "With this achievement all the northern provinces have been purged from Daesh militias, which will ease the life of local people," asserted the insurgent spokesman, using the local name for IS. The Taliban controls or contests nearly half of Afghanistan's 407 districts and continues to inflicts heavy casualties on Afghan security forces. The Islamic State terrorist group launched its Afghan operations in early 2015 from bases in Nangarhar province, which borders Pakistan, and has since expanded its activities to the nearby eastern Afghan provinces of Kunar and Nuristan and to Jowzjan in the north. The emergence of IS in Jowzjan has been a particular concern for Russia. It is widely perceived that Moscow’s closeness with the Taliban in recent years stemmed from fears that ungoverned spaces in northern Afghanistan, near the border with Central Asian states, could undermine Russian regional security and territorial interests. IS, locally known as Daesh, has claimed almost all recent terrorist attacks in Nangarhar that killed scores of Afghan security forces and civilians, including members of the country’s tiny Sikh minority. Smoke rises from an area where explosions and gunshots were heard, in Jalalabad city, Afghanistan, July 31, 2018. 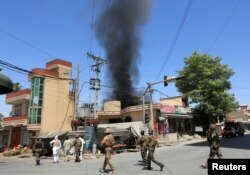 The latest IS attack took place Tuesday in Nangarhar’s capital, Jalalabad. The coordinated suicide attack killed 15 people and wounded 15 others. The assailants targeted the office of refugee and repatriation in the city when a big meeting of relevant aid agencies was under way. The United Nations confirmed Wednesday a female employee of the International Organization for Migration was among those killed and another was wounded. The Taliban denied its involvement in the Jalalabad incident, strengthening suspicions it could be the work of IS, although IS has not officially taken responsibility.